Last week I was working in Hanoi which has risen to the top of my favourite cities in region. On three evenings I enjoyed Vietnamese, Argentinian and French food that was as good as all the posh places in Singapore and considerably cheaper. On the last night, I was taken to the Hanoi Halia which belongs to the same group as the two 'ginger' restaurants in Singapore. 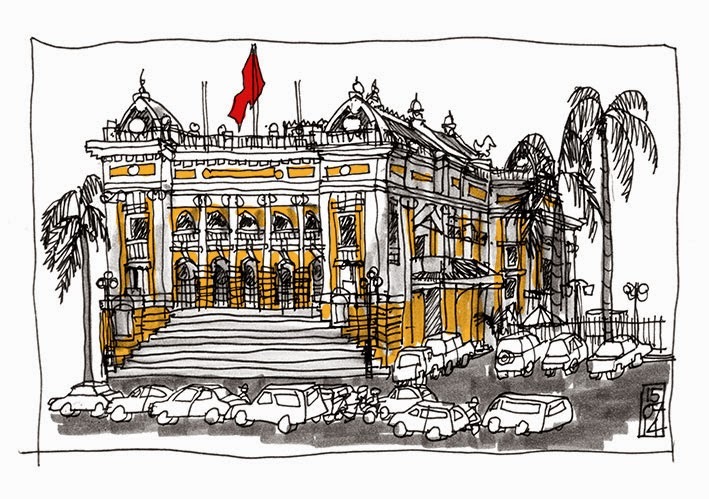 My hotel, the Hanoi Hiliton Opera Hotel (not the Hanoi Hilton, that's something else) was next to the unmistakably French colonial Opera House which was built in the early 1900s. There was little time for sketching on this trip, but I grabbed a moment around sunset on the first day to sketch the building from the other side of the roundabout. Well, I say roundabout, but cars followed a sort of Spirograph pattern in all directions around the small central island. Crossing the road through all the bikes is quite a hoot. I was quite pleased that the doodle took little more than half-an-hour, although due to fading light I finished the cars with a fine glass of Chilean Errazuriz Reserva and a plate of duck breasts on puréed sweet potato. Very pleasant. Perhaps Mrs M will get her trip to Ha Long Bay after all.